in fine weather, a serious runway incursion occured ta Barcelona´s El Prat Intl Airport. 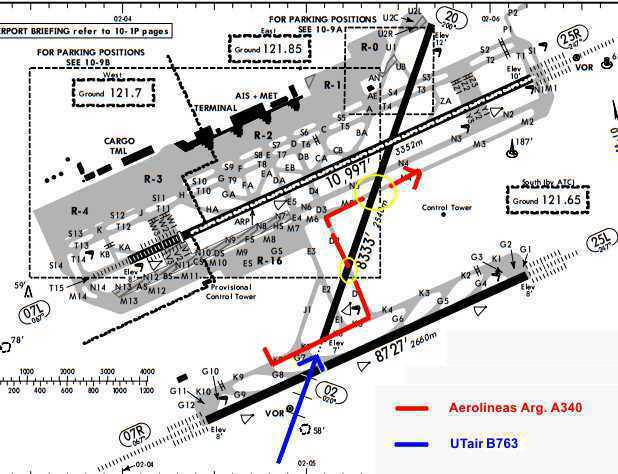 The Aerolineas Argentinas Airbus A340 was taxiing along taxiway „Kilo“, crossed the threshold of runway 02 for the 1st time. Then the pilots intended to depart from runway 25R (instead of the shorter 25L) and turned left into taxiway „Delta“, crossing the active runway 02 for a 2nd time. After 800 meters, the A340 turned right into taxiway „Mike“ which brings the flight to the beginning of their intended departure runway. Therefore runway 02 was crossed for a 3rd time. At the same time the UTair flight was over the approach lights of runway 02. When the pilots saw the Airbus A340 entered the active landing runway (on which they already were cleared to land), an immediate go-around was initiated to avoid a runway collision. The Boeing 767 landed safely on its 2nd attempt on runway 02 a few minutes later. Runway 02 is rarely used for landings and most pilots commonly do not request crossing clearance or check for active traffic on that runway. Spanish authorities played down the occurence stating the 767 could have landed safely because the crossing A340 was far enough down the runway. The distance between the touchdown point and taxiway „Mike“ intersection is about 650 Meters. The total distance available on runway 02 is 2540 meters. However, the landing distance required for a medium laden Boeing 767-300 in optimum weather conditions and with flaps 30 is (according tro Boeing specifications) about 1450 meters. Spanish authorities have begun an investigation. Initial press reports reveal that tower controller first cleared the 767 to land then issued a taxi clearace to the A340 incorporating the crossing of the active runway 02. For noise abatemant reasons during night time (23:00 – 07:00) the preferred landing direction is 02 while most departures where cleared from runway 07R.